Added on March 31, 2019 by bryce lankard. Big thanks to the wonderfully talented Dan Rosen, who converted and posted this old promo video from Tribe Magazine. It brought me back to the heady days of the early 90’s, when a small group of us started this extremely fun and trouble-making publication, which became a wildly creative outlet for the writers, photographers and artists of New Orleans. We got a ton of attention and won numerous awards and I was proud to have been its creative director. It was all to short-lived, but was one of the most gratifying times of my professional life. Added on July 13, 2018 by bryce lankard. I woke up today with a warm and fuzzy feeling. Many are the days that are filled with frustrations, when one wonders if any of the things you do make any difference at all. This was not one of those days. Yesterday I drove through rush hour traffic to meet up with Aaron Zalonis to go to the opening of Tama Hochbaum’s wonderful show, "Over/Time; Imaging Landscape,” at Cam Museum. It is a beautiful show and I recommend it to everyone. I have the good fortune of knowing Tama, who is a remarkable and multi-talented woman and artist. Some time ago I was working with Eric and Gab at Cam on a public art project related to the building going up across the street, The Dillon. Over the course of that I thought that Tama’s work might be a great fit for the idea. I was able to introduce Tama and her work to the CAM team. Neither Tama nor I were selected for the project, but the folks at CAM fell in love with her work. Now, a year or so later, here was her work gracing the walls of CAM. I am so proud of Tama and her amazing project. Aaron and I stepped outside of CAM to look at the nearly completed Dillon building. There on the exterior of the building was the first of what will be an ongoing series of giant banners of art. While my own work wasn’t chosen for this, (Not colorful enough…too many people) I did get to negotiate the contract that hopefully will get all the future artists who show there paid and collected. The first banner was up! We walked down the street to check out the newly opened Train Stations. All sparkly new and modern, it has been years in the making. Walking through the lobby, right next to the ticket booth, was an installation of photographs. Lo and behold, it was the work of my prize student, Karen Healy! Karen has been working and hustling on her great documentary project on commuter train travel across NC called “A Palette of Rust and Dreams” and now a selection of it is on permanent display! Amazing. It was nice driving home thinking about the successes of these talented and deserving artists and ideas. It was heart-warming to think that even in the tiniest way, something I may have done helped lift up my fellow artists. It does matter after all I suppose. Like I said, warm and fuzzy. Added on March 4, 2018 by bryce lankard. Thanks to Michael Pannier for hosting my exhibition at his very fine new space. And thanks to all who have contributed to this project and came out for the opening. I am pleased to be adding first person accounts of special relationships with bodies of water. Thanks to all who have allowed me to use their thoughts and words. They say it so much better than I ever could. I was born of water. Baptized in the sea and salt of the Atlantic Coast. Even now, walking a city’s streets, I can hear the ocean pulsing in my left ear. Summer days, at our tiny cottage on Wrightsville Beach, my mother would lean into the screen door, and my brothers and I would empty out into sunlight. I was only eight or nine, but the beach, with the ocean on one side and the sound on the other, was an enchanted playground. We were taught to swim within our limits, and always to respect the water. Down from our street was Johnnie Mercer’s Pier, where you could buy an orange sherbet push-up or a frozen candy bar for five cents. Sometimes the fishermen would catch a mako shark off the deepest pilings, and “gaffers” would drag the creature to shore, its carcass usually ten times or more my size. Those were the days—yes, privileged times—when I ran fleet of foot by the surf with my gull-chasing dog. When I waited on the porch each afternoon for my father to come home from work so we could swim together before supper. My love of being on the water began on a small island in North Carolina and has traveled with me all my life—to the Pacific Ocean on both sides of the equator, to the Black Sea, to the rivers and lakes of Upstate New York. Today, I am happiest and most free when I am paddling my kayak quietly on an Adirondack flow. I know that I am just a small part of a vast ecology—no more important than any smallmouth bass, or yellow birch, or great blue heron. Yet able to plead in words: We must protect our waterways and our wild places for generations to come. We must make sure that young people can navigate a clean and healthy planet, that they will have vibrant oceans, rivers, and lakes to teach them their place in the natural order and to fill them with wonder. Added on October 21, 2016 by bryce lankard. Added on August 3, 2016 by bryce lankard. I am so thrilled and honored to have just been selected as a Juror's Pick for the just announced 2016 Daylight Photo Awards. "It's true. Bryce Lankard was indeed my 2016 Daylight Photo Award Juror pick for his work in his "Drawn to Water" series. I looked at it, and it made me grin each time I went back to it, a strong edit of well seen images with a sense of childlike wonder, classically sensitive, seemingly well printed, etc. Added on July 1, 2016 by bryce lankard. My photo essay entitled "Drawn to Water" is featured in the summer 2016 issue of the Southern Cultures Journal. Added on June 9, 2015 by bryce lankard. I am very honored to have had an piece of mine selected by juror Marshall Price for this wonderful show at the VAE in Raleigh. SCOPE features variations on the southern landscape; looking at the region through the eyes of its artists. Works feature visual interpretations of metropolitan, coastal and rural areas of the southern states. Q What is your broadest definition of landscape work? A The idea of the land, or landscape, is one that transcends mere representation in art or literature and is an inherent part of the American consciousness. Since the years of the early Republic, the land has played a tremendous role in providing artistic inspiration, shaping governmental legislation, causing violent disputes between factions, furnishing economic opportunities, presenting a perceived resource to be consumed, and even serving as a spiritual metaphor. My early graduate education was focused on artists of the Hudson River School and I’m interested in the changing strategies and approaches to the land by artists since that time. Added on April 7, 2015 by bryce lankard. I am pretty sure she never sleeps. Without a doubt she seems to always be working. 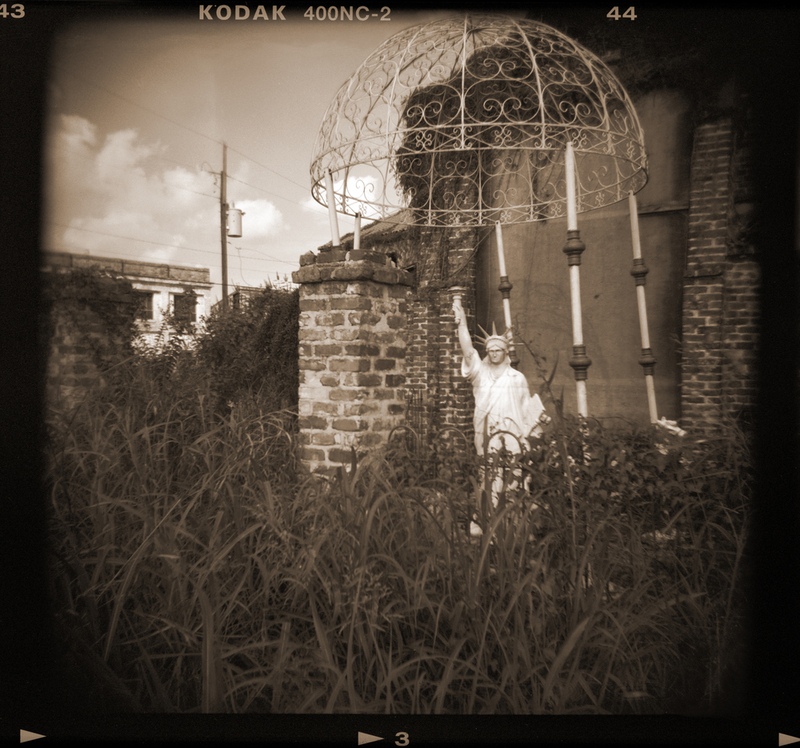 This month Lori Vrba has THREE VERY LARGE art happenings here in the triangle. The release of her first monograph, The Moth Wing Diaries, has been published by Daylight Books. I doubt it will be her last. I have been lucky enough to have held a copy in my hands. It is a lush and beautiful art object by itself and contains a wonderful and elegantly designed collection of her photographs. That would be enough for most people. Not Lori Vrba, who also has not one, but two exhibitions this month. The first has opened at Daylight's Project Space in Hillsborough and is also called The Moth Wing Diaries and greatly reflects the look and feel of the book. The second opens this Sunday, April 12th at the historic Horace Williams House in Chapel Hill. It is called Drunken Poets Dream after another large body of work. Both of these wonderful exhibitions contain unique presentations of photographs, assemblage, and installation in Lori's distinctive style. Each offering speaks to the other and to the book in such a layered and personal way. This dialogue promises to give a viewer who has made the effort to take in all three a great sense of the depth and range of Vrba's voice. It is this honest and southern and feminine and introspective viewpoint that has brought Vrba much of the attention she has received. Lori credits moving to North Carolina and living in Chapel Hill with much of the inspiration and landscape that permeates her imagery, but most of her exhibitions and acclaim have come from elsewhere, other states and other countries, most notably in her native Texas. These two exhibits give our area an all too rare chance too bear witness to a special talent, to one of our own. Do yourself a favor. Go. See. Added on March 18, 2015 by bryce lankard. I am pleased to announce that this month I have moved into a new space at Golden Belt Studios in Durham, NC. I am looking forward to seeing what comes of this social and arts experiment. I hope to produce new work in a space surrounded by friends and artists, and to share work, both new and old, with the public. I am very excited to take part in my first 3rd Friday art walk. My friends Warren Hicks, Heather Gordon and Ben Bridgers will all be here in their studios, and taking over the building will be Rachel Herrick and her great "Northern Obeast" project. To inaugurate this space I have pulled out a large selection of work from my project "Blink of an Eye" to showcase. Large parts of this have been exhibited around the country, but never in one single chunk. blink of an eye - a very short time (as the time it takes the eye to blink or the heart to beat); - an indefinitely short time. Blink of an eye, and it’s gone. This body of work examines moments and places we can often take for granted - those we think will always be around, and then, in the blink of an eye, can be gone. This project is my personal response to the events surrounding both 9.11 and Hurricane Katrina. Having been saturated with images of destruction, the intent in "Blink of an Eye" is to examine a more psychological and emotional response to a sense of loss, dislocation and isolation. I have used toy cameras and the soft, gauzy look they provide in order to create images depicting more of a sense of nostalgia, tinged with sentimentality and even optimism. I feel that this notion of loss can be applied to physical objects such as buildings or cities, but also to more ephemeral concepts such as summertime, mortality and youth. My photographs reflect these recurring themes through iconic childhood and leisure-time subjects such as playgrounds, carnivals and midways, such as the final days of Coney Island, quiet moments, and off-season vignettes. By occasionally using double exposures and image sequences arranged out of order I also want to cause a sense of discomfort and disruption. Added on February 27, 2015 by bryce lankard. After listening to much heart-rending testimony the past couple weeks on the life and life force of the late Dean Smith, I have been motivated to dig out a few old prints from the archives. I was lucky enough to have been a student and photographer for a great stretch of Dean Smith's Tarheel teams. I got to see the last game at Carmichael, which wasn't, in fact, the last game. And the first in the Dean Dome. I was blessed to see many great opposing players, foes like Ralph Sampson, Jay Bilas, Spud Webb, Johnny Dawkins and Len Bias. But even more blessed to photograph and witness many Tarheel greats like Sam Perkins, Brad Daugherty, Michael Jordan, Kenny Smith and more. We were fortunate to learn to shoot our color slides in the "sports illustrated" style, which meant we mounted studio strobes in the rafters of Carmichael and synched them by direct pc cord to one camera. These images are not those however, these are the Tri-X pushed to 1600 available light images. A few quick scans and not spotted. I hope you enjoy. Brad Daugherty and Lorenzo Charles mix it up during a game. ground level view of an inbounds play. Buzz Peterson might even be setting a pick. Added on December 22, 2014 by bryce lankard. I want to thank Heather Gordon and Warren HIcks for inviting me to do a show installation at the Golden Belt Studios this month. It was the first chance that my project "Transience" had a life outside of its portfolio and got on some walls. I also added a kinetic piece that was site specific and finished editing a short companion film called "precipitate" that ran during the opening. It was a real joy to participate and I would also like to thank all those that came out on Friday. Added on December 2, 2014 by bryce lankard. I am so pleased to be included in this years edition of the blue library at the press street gallery in new orleans. tammy mecure did a wonderful job organizing and curating this exhibit and i am tickled to be in this show with both old friends like owen murphy and new ones like eric pickersgill. photonola once again looks to be a fantastic event, and i only wish i could be in attendance this year. Added on October 24, 2014 by bryce lankard. i thank Aline Smithson for this wonderful article on the posse show at slow exposures. TIME, PLACE AND ETERNITY: Flannery O'Conner and the Craft of Photography. Added on October 6, 2014 by bryce lankard. hey all, i am looking forward to rocking old school at this slide show for the Click! photo fest. putting together my carousel right now. why don't you do the same, or at least come out and see what is projected. did i mention the free pizza???? Click! Triangle Photo Festival, FRANK Gallery, Cultural Arts Division, Town of Chapel Hill Parks & Recreation, and Cassilhaus present BYOCLC (Bring your own Carousel and Lawn Chair) Slide Show Night. Analog 35mm Slides Only! Click! Triangle Photo Festival invites you to an old-school slide night. Bring the family, a carousel slide tray (maximum 80 slides) and lawn chairs and share your 35mm masterpieces. Slides will be screened without narration, but you may make a brief introduction for a total presentation time per person of 10 minutes. Projectors and screens provided. Work should have originated in 35mm slide format. Free Pizza generously donated by Old Chicago Pizza and Taproom. Added on October 5, 2014 by bryce lankard. Added on September 29, 2014 by bryce lankard. music This Little Light of Mine by Odetta all rights reserved. Time, Place and Eternity: Flannery O'Connor and the Craft of Photography...A photographic exhibtion created in honor of the 50th anniversary of Flannery O' Connor's death. We, The Posse were inspired by her writing and her life. This installation on Split Oak Farm in Zebulon, GA was built by Anne Berry, S. Gayle Stevens, Bryce Lankard, Ann George and Lori Vrba. Our beloved advisor and roadie Dennis Kiel was invaluable...as usual. shout out from The Southern Photographer about posse. Added on September 5, 2014 by bryce lankard. John Wall wrote a lovely piece on the SlowExp fest and us. check it out. Added on September 3, 2014 by bryce lankard. (9) things to do in denver when you're adrift. Added on August 5, 2014 by bryce lankard. short video of hightlights and still images from my recent trip to denver.